Senate Judiciary Committee Chairman Lindsey Graham (R-S.C.) announced March 25 that his committee will investigate alleged abuses of the Foreign Intelligence Surveillance Act, which resulted in the yearlong surveillance of a former Trump campaign associate. The day after Attorney General William Barr exonerated President Donald Trump of allegations of collusion and obstruction based on the findings of special counsel Robert Mueller, Graham called on Barr to appoint a second special counsel to scrutinize the events that led to the counterintelligence investigation of the Trump campaign. 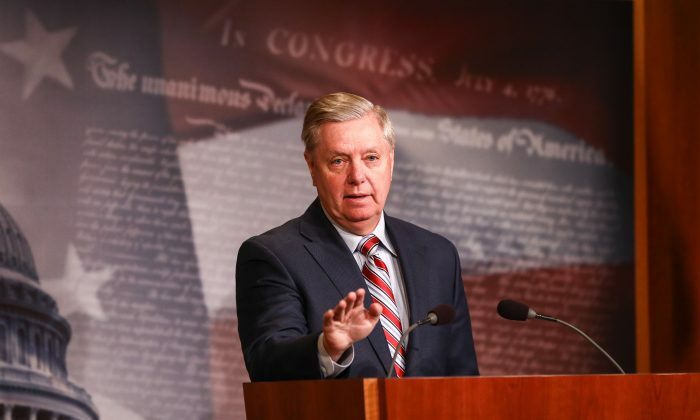 “I hope Mr. Barr will appoint somebody outside the current system to look into these allegations, somebody we all trust, and let them do what Mueller did,” Graham said on Capitol Hill. Graham has been calling for the appointment of a special counsel since 2017, when the first traces of evidence surfaced pointing to a potentially illegitimate surveillance operation against the Trump campaign. Graham’s announcement echoes the calls from other Republicans, the president, and his allies to investigate the Obama administration officials involved in what appears to be an extensive, multi-pronged, international surveillance operation targeting Trump and his associates before and after the 2016 election. Efforts to unravel the surveillance operation by congressional investigators and the Justice Department watchdog have so far been impeded by the existence of Mueller’s investigation, which took over the FBI’s probe of the Trump campaign. As a result, the Justice Department has stonewalled requests for transparency, on concern the release of information might create the appearance of interference with the special counsel investigation. The completion of Mueller’s investigation opens the doors for further scrutiny of questionable actions taken by senior Obama administration officials in relation to the Trump campaign as far back as 2015. “The fact that they spent two years trying to delegitimize the president’s victory in 2016 is disgusting and there are a lot of people who should answer questions,” Sanders said. The FBI officially started its investigation of the Trump campaign in late July 2016. The probe was led by Peter Strzok, then a senior FBI official who showed anti-Trump bias in text messages with FBI attorney Lisa Page. Strzok and Page discussed stopping Trump from winning the election, an “insurance policy” in case he won, and the prospects of impeachment after Trump was elected. The investigators eventually obtained a Foreign Intelligence Surveillance Act (FISA) warrant to spy on Trump campaign associate Carter Page. The core of the application for the warrant consisted of evidence from the so-called Steele dossier. In their application to a secret surveillance court, senior FBI and DOJ officials failed to disclose that the Clinton campaign and the Democratic National Committee paid for the dossier. The officials also failed to disclose that the author of the dossier, former British spy Christopher Steele, was biased against Trump and didn’t want him to be elected president. Steele paid second- and third-hand sources with ties to the Kremlin for the information in the dossier. Trump has long derided the special counsel’s investigation, due to its questionable roots. Mueller’s conclusion is the final nail in the coffin of the Steele dossier, every allegation in which has proven to be either debunked or unsubstantiated despite intense investigations by Congress, the media, and now the special counsel. Correction: A previous version of this article misspelled Sen. Lindsey Graham’s name in a caption. The Epoch Times regrets the error.